- Loading capacity: Carry 4 snowboards or 6 pairs skis. ✔ Don't Delay! Stock is Strictly Limited! CLICK the 'Add to Cart' Button at the Top of this Page. Fits factory crossbars less than 3 in. wide and 1.5in. thick. It also fits Thule and Yakima square, round and wing-shaped crossbars. 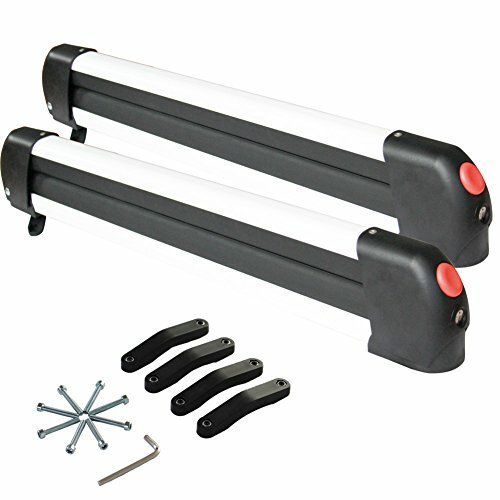 Ski Car Rack hold up to 6 Pair Ski or Snowboard car rack hold up to 4 Snowboard , it is also ideal for carrying fishing rods, paddles, ski poles and water skis. 15 mins installation for Ski roof rack, ski carrier for cars, leave room on your roof rack for other gear like bicycles, cargo boxes, kayaks, etc. Soft rubber moulding to protect your skis or snowboard. One-button access allows gloves-on operation ,includes Key & Lock for thief protection. If you have any questions about this product by Onefeng Sports, contact us by completing and submitting the form below. If you are looking for a specif part number, please include it with your message.